Progress, like peace, comes dripping slow. Running in and out of spring showers to get tarps on everything, I conceded to the weather gage and moved upstairs. Lighting is much better; windows for daylight, ample incandescents for night work, and my workbench is up here. Chippy is asleep on a pile of Cashmere sweaters in the upstairs bedroom, so he isn’t underfoot at the moment and I can write this in peace. I put a few screws through the hull, dispensing with the awkward straps and clamps we had used to pull the sides together. The curved blocks screwed to the molds are working; I now have about three dozen Pony clamps plus blue tape, which may well be one of the most effective clamps ever invented. 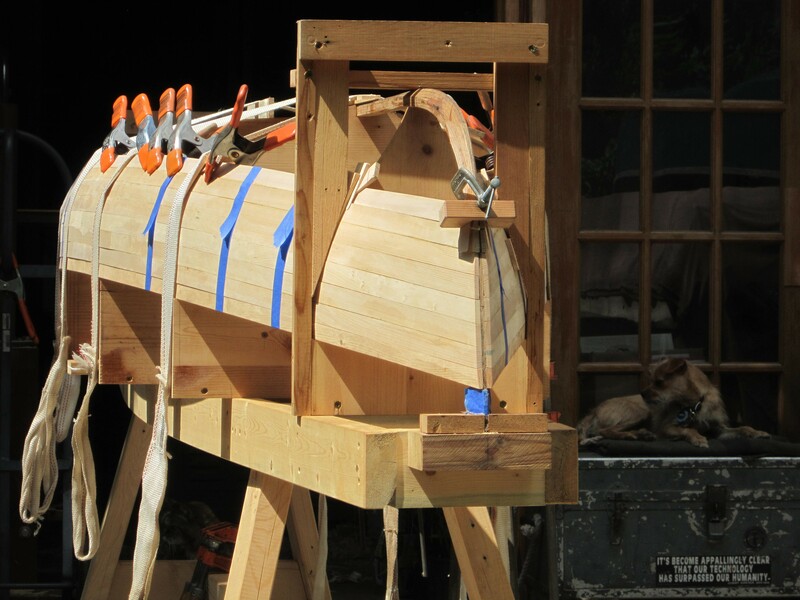 As we moved from the relatively straight sides into the turn of the bilge, the width of our strips simply would not conform to the twist of the hollow forefoot. Wider strips buckled outward at the bilge, becoming tangent rather than chord, and tended to split at the extreme twist between stations 1 & 2. The solution turned out to be ripping them in half (Occam’s table saw…). At this point, the hull is slightly off the molds, but the line is fair, and the narrower strips are allowing me to roll back inward at the bilge. The stem has continued to narrow, from 17º on each side at the sheerline, to 10º at this point ~10″ above baseline. Markkula’s drawings (from Attwood Manley’s Rushton and his times in American Canoeing) are not as thoroughly developed as one might expect from a professional designer, but the table of offsets is sufficient to produce a body plan and (apparently) a fair set of molds. He obviously didn’t draw anything that he couldn’t see, so there aren’t any sections for the stem, only a profile. But, damn, what a noble profile. 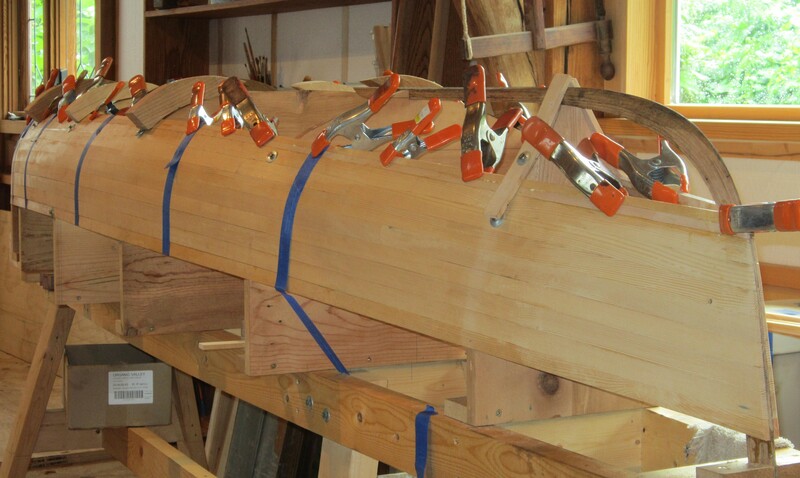 This entry was posted in boatbuilding, carpentry, Uncategorized, woodworking and tagged Rushton canoes. Bookmark the permalink. 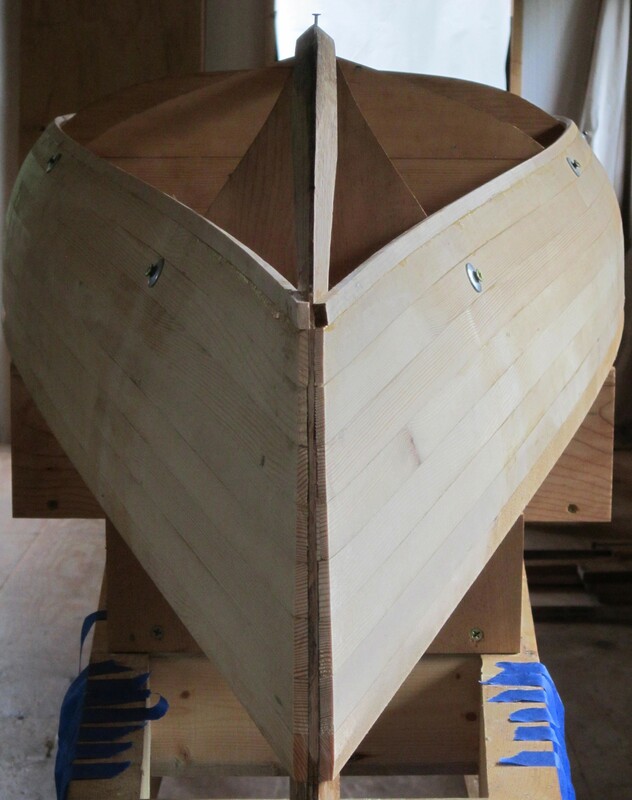 I am loving seeing your canoe come together. Hope it serves you well.